Harrogate CC stunned ECB Yorkshire Premier League North leaders York on Saturday following a thrilling climax at Clifton Park. George Ross’ troops went into Saturday’s fixture knowing that defeat could see them slip back into the relegation zone, but they held their nerve to bowl out their high-flying hosts in the final over, just five runs short of victory. The Roosters promoted Corrie Keable up the order to open the batting and he struck 14 fours and a pair of sixes on his way to a superb knock of 94. Ash Griffin was the next highest scorer with 22 not out, and ‘Gate were eventually bowled out for 182 in the 40th over. Wickets from Tom Geeson-Brown (3-42) and skipper Ross (3-21) then reduced the home side to 90/6 in response, however an unbeaten half-century from Ted Patmore (50 not out) brought York back into the gam. It looked as if the title favourites were going to edge over the line before two wickets late on from Will Bates turned the tide in the visitors’ favour. Still, York found themselves needing only five runs to complete the job and wrap up a 11th win in 12 league matches, only for Griffin to strike again with the penultimate delivery of a gripping encounter. The Roosters were unable to make it two wins in as many days when they entertained Aston Hall in the Yorkshire Leagues Knock Out Cup quarter-final just 24 hours later. Missing more than half a dozen 1st XI regulars for the 40 over per side showdown, Ross’ team posted 203/7 from their 40 overs. Bates led the way with an innings of 51, while Ross (46) and Keable (25) also contributed. 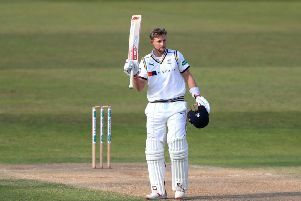 The Yorkshire Premier League South outfit made light work of their run-chase, however, reaching 205 for the loss of only a solitary wicket and with 8.2 overs in hand.